1. I am the youngest child in a family with 4 children. 2. I met my husband the first day of college. 3. I was an Elementary Art Educator for several years. 5. I met Christian Slater and Martha Plimpton (Actors) because of an art award that I won in HS. 7. I met my best girlfriend when I was 7 years old and we are still best of friends! -Thank the person who gave you the award and link them back to your post. -Tell us seven things about yourself. -Contact these bloggers and let them know they've received their award. This was interesting to learn more about you. How interesting to have pet ducks! Congratulations and thank you!! 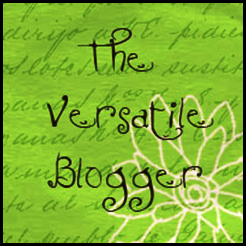 Welcome to the blogging world... it's quite addicting! Awww... Thanks! Love your blog and great to learn more about you. Thank you for the award! I'm jealous that you met Christian Slater! I had ducks growing up, too, but not in suburbia! Melissa - Thanks for the mention and the award! Fun to read the 7 facts about you - love the ducks, the friend for life and your brush with famous people!